5 things we learned watching Planet Earth II on Ultra HD Blu-ray | What Hi-Fi? 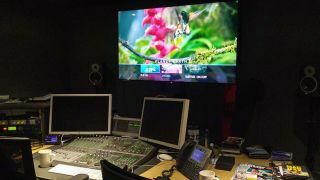 With the landmark nature documentary due to be released on Ultra HD Blu-ray in March, we previewed the international version of ‘Disc One’ at a Sony editing suite - and it revealed the astronomical achievement of the BBC and Sony collaboration behind it. If Planet Earth II became a standard Sunday evening fixture in your home last autumn (as it did for nine million-odd people in the UK), you’ll know that 4K and HDR aren’t necessary technologies to induce an ‘ooh’ and an ‘aah’ from you every other minute. Full credit to the filmmakers as the series, like the original, was beautifully shot - regardless of the technology used. But that’s a bit like saying you don’t need custard to appreciate a slice of apple pie, which (most people will surely agree) is true. But with it, it’s 10 times better - as, in the case of Planet Earth II (not the pie, sadly) we were fortunate to find out last week. As PE II was shot in Hybrid Log-Gamma – the BBC and Japanese national broadcaster NHK's form of HDR, which can, unlike alternative HDR formats, be decoded by both HDR and non-HDR receivers – it had to be re-encoded into HDR10, the HDR format suitable for physical media, for the Ultra HD Blu-ray. It wasn't a quick task, we've been assured. While the original HLG files were around 300GB, the TIFF files were almost 4TB, so there was a lot of data to physically export and copy. The good news is that it’s perfectly do-able. While some Ultra HD Blu-rays offer object-based immersive sound, such as Dolby Atmos and DTS:X, PE II’s track has a straight-up 5.1 DTS-HD audio track – anyone familiar with the making-of ‘Diaries’ segment at the end of each episode should have a good idea why. It can take months for the videographers not only to get up, close and personal to certain wildlife but also to capture them on camera, so it’s hardly surprising that extra equipment and overhead microphones was deemed impractical. You can tell Tom Hanks to go again, but not a hippo. Still, in our demo the track sounded impressive, with the familiar Attenborough narration crystal clear and the fittingly majestic Hans Zimmer score making just as big a mark. We look forward to hearing it through our reference PMC Twenty 23 5.1 speaker package soon. Of course it’s easy to say, “it was all worth it” when we weren’t the ones slaving over computers for hours, but we can’t see how it wouldn’t have been. Viewed on the Sony KD-65XD9305 TV and Panasonic DMP-UB900 4K Blu-ray player during the demo, and from just a handful of clips of the first three episodes – Islands, Mountains and Jungles – Planet Earth II could be one of the (if not the) best examples of 4K/HDR material we’ve seen. We can't wait to try it out on some even better kit, such as the Samsung UE65KS9000 or an LG OLED TV, or even a Sony VPL-VW550ES projector, with the Oppo UDP-203 player. When the series started filming four years ago, the BBC knew its release would tie into the 10th anniversary of Planet Earth, and so to mark the occasion it was filmed, mastered and set for release in 4K. Therefore, unlike some 4K Blu-ray titles, such as Life of Pi and Star Trek Into Darkness, that are derived from lower-than-4K Digital Intermediate masters, there’s been no upconversion involved in bringing the series to the disc. This is the real deal: true, bona fide, native 4K stuff. Fabulous. The format really does the filmmakers justice. Not only are close-ups of Komodo dragons, snake scales, tree bark and even stems within leaves pin-sharp and easily perceptible, just as impressive is the level of background detail behind the in-focus objects in the forefront, and the depth the higher resolution gives to the expansive shots of the Himalayan mountains. When we weren’t peering through fingers at the racer snake and baby iguana chase, the action sequence was stable, with the clarity of the ‘camouflaged’ snakes against the rubble a credit to the detail unearthed. As HDR is all about expanding contrast ratio and colour reproduction capabilities, it’s no shock to the photoreceptors that the pinks of flamingos, the yellow of an eagle’s claw and the multi-coloured feathers of a Hummingbird are wonderfully vibrant and realistic. It’s also the surfacing of smaller things that help to build realism: the faint flicker on flowers from a bird’s wings, the variation in steam billowing from hot springs, and the snow specs on a bobcat’s fur coat – all noticeable in our demo. Then there’s the glistening of iguana scales, and none of the usual banding around trees when light shines through them. We can only reiterate our report last October, which is good news for non-physical media. With Amazon, Netflix and YouTube making headway with 4K and HDR streaming, and BT Sport Ultra HD and Sky Q broadcasting in the superior resolution, the BBC is planning to launch more 4K material on its on-demand iPlayer platform, taking an ‘internet-first’ approach due to it finding 4K broadcasts ‘difficult’. Chances are that will mean your 4K TV’s support of 4K iPlayer will have to come in an update. With the birth of HLG and the success of the 4K iPlayer trial late last year, there will surely be more BBC programming in 4K and HDR, perhaps as soon as this year. But it might not be only 4K programmes that have HDR in the future. While often bundled together, the two technologies aren’t mutually exclusive, and with the announcement that some Full HD TVs in the Sony 2017 TV line-up will support HDR, the tongue-twisting 'HD HDR' may become a ‘thing’. The BBC has 10 years of HD content in the bag, so we wouldn’t bet against some of it being re-released in HDR in the future. The original Planet Earth perhaps? Planet Earth II 4K UHD Blu-ray, which comprises two Ultra HD Blu-ray discs (three episodes on each) and a standard Blu-ray that features the entire series and ‘Making Of’ extras in HD, will be released on 13th March. It will cost £40, and is now available to pre-order from Amazon.